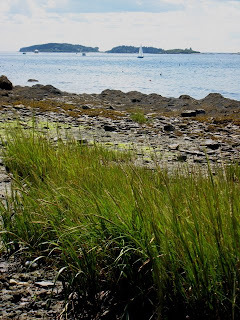 Harpswell is a collection of islands and a long peninsula, dipping like long fingers into the Atlantic Ocean. I’ve heard it said that Maine has more miles of coastline than California. I don’t know if that’s true, but it sure feels right. 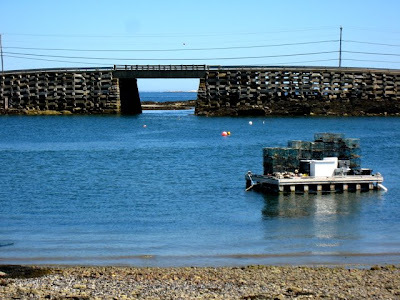 Bailey Island boasts of having “the world’s only cribstone bridge.” That’s most probably true as I’ve never seen anything like it anywhere else. Slabs of granite, erected like Lincoln Logs, form an open lattice to the sea. You can see right through the bridge as the tide washes in and out. 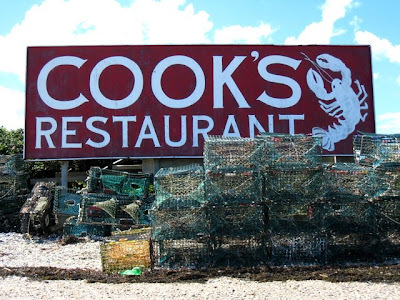 The larger opening is for lobster boats to drop their catch at Cook’s Lobster House. Beware of delays if you’re driving as the bridge is being repaired. The Island Romance ferry from Portland brings tourists to Cook’s for lunch, but it approaches from the sea as do the many sailboats anchored in the harbor. Portland with 65,000 residents is the biggest city in Maine. Bailey Island has only 400 year round residents. Usually we only go to Cook’s when people “from away” visit, but my kids felt like they’d been away long enough in England to merit lunch. We always start with the delicious fried calamari. The local mussels and steamers (clams) are delicious too. My son had the deep fried local shrimp in a bun and was upset to find it came with no greens (welcome to the USA.) My daughter orders non-seafood off the kids’ menu. If it’s lunch, I get a lobster roll and fresh coleslaw. For dinner you’d have to get boiled lobsters. They do them well. My kids are huge fans of the mud pie parfait served in an old-fashioned ice cream sundae glass with a long spoon: coffee ice cream, fudge sauce, oreo crumbs with whipped cream and a cherry on top. The view out of the many windows is amazing. 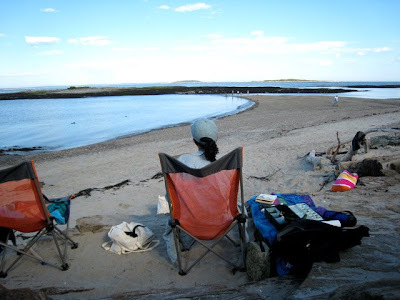 I set a couple of scenes from my novel Moose Crossing on Bailey Island, including one at Cook’s. A central character in my novel S.A.D. is a lobsterman living on an island in Harpswell. After lunch we headed to Cedar Beach, where the sea is thick with lobster buoys. It’s a small private beach with very limited on street parking. You have to walk 1/4 mile through buggy woods, meaning fewer crowds. Not a good beach to go at high tide as there would be little sand, but at low tide you can walk to a mini island and explore. My kids enjoy catching the many hermit crabs, wading through seaweed and climbing over the rocks. This is not a beach for the tender-footed. I painted the watercolor on my bio page one fall at Cedar Beach, and the lobster boat harbor photo is on Bailey Island too. There are more Bailey Island paintings on my watercolor page. In the summer my wardrobe is a bathing suit and a smock. I swim first to cool down. I can paint the view while sort of keeping an eye on the kids. It was take the kids to work day! Now that sounds ideal, but I’ve only just been able to manage it. My children are 11 and 14 and good swimmers. They are also good photographers. My son took the photo of me painting from behind, and my daughter took the front shot. My daughter wrote a story in her journal beside me while her brother dug a pit. They are usually good at not interrupting my concentration, but I prefer working on my own for longer hours. Even at a remote location, I’ll run into people I know. It’s just as well that I was covered up for the sun as my doctor was there with her kids too. Remember how people used to compare tans? These days the competition is over the strongest sunscreen. I won with 45 zinc oxide over my doctor’s SPF 30 lotion. We tease each other because we are friends too. Lines blur in small towns. Unfortunately, my first attempt at watercolor painting in a year also became a blur. I was rusty and without my favorite tools. Would you believe the only thing I lost in the move back from England were my paintbrushes? I have spares of my two favorites but will be buying more at Artist & Craftsman Supply in Portland today. I might also have to head back to Sapporo for a tuna sashimi lunch. I’ve only painted 2 days because of all the rain, but at least on the second day I produced a good painting. We were lucky that day. Can you see the rain clouds passing out to sea? In the afternoon the light improves, allowing me to intensify the colors and to find the shadows. The problem is that the tide changes too. Working on larger seascapes, I sometimes come back over several days to catch the tide and light. Bugs can be a distraction, as can people who stop to chat. I get in a meditative trance while working. It’s never easy painting on location, but it does lend greater vitality than working from a photo. What I see with my eye is very different from what the camera lens captures. What I choose to paint versus photograph is quite different too. A photo is an instant. A painting is a vision unique to me. I often change the elements for the composition and let the wet pigment flow on its own. I love both media. The biggest problem is I’m so absorbed in my work that I can’t engage the kids. It’s still more fun for them to go to the beach while I paint than to stay home while I write. I also need longer blocks of uninterrupted time to compose a novel, which I find while the kids are in school or at camp. It’s nice having two careers that mesh well with the seasons and raising children. I work half days over the summer so that I can still focus on the kids. We all need some down time to enjoy the glorious Maine summer. The blog keeps my writing free from rust. Also, in some ways, I am working on my next novel. The central character of my work in progress is a painter too. It will be interesting to combine my two passions of writing and art in one book. As much as I love painting, I’m counting the weeks until I can get back to novel writing. The summer is going by so fast. Your children take after you in their artistic abilities. I love hearing about your many careers (mother, writer, painter) and how you are able to successfully mesh them all together. 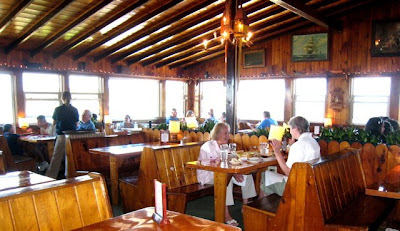 I was looking for my niece in your Cooks Lobster picture, she is a waitress there. She told us we should come eat there on our visit, we said-no thanks! As you said, it is a special treat. Your kids did a good job of photographing you painting. How great a summer is this? I love that you have different seasons for your careers. Great idea! No burn-out that way. Beautiful pictures. It makes me want to rush up to Maine this instant! BTW, I knew Portland was the biggest city, but I didn't realize it was that small! I grew up in a town of 175,000, and it wasn't a big town by California standards. Too crowded over there. JAPRA, what an interesting observation about color. You are definitely an artist. Inland Maine is quite green, but nothing beats the UK. My English husband’s favorite color is green, but I’ve always loved the blues. Cindy, I do mesh my 3 jobs together, but I’m not sure how successfully! Tina, we had a really good waitress at Cook’s, but I didn’t catch her name. I do love Maine in summer, but it’s been unusually wet since we got back. It poured today with no more sunny days on the forecast. I feel bad for the tourists. Alyson, everything is smaller scale in Maine except for the landscape. Sarah, I took a trolley tour of Kennebunkport when I was there and our guide claimed that Maine has more miles of coastline than any other state (which must include California!) He has also told us that Maine has more vacation homes than any other state . . . which is also easy to believe. I'm sure that you long for some solitude at times . . . but it is lovely that your children absorb the artistic, intellectual atmosphere that you and Henry create together. One food-related question: Do you like your lobster rolls with drawn butter or mayo? Bee, if the trolley tour guide said it was true, it must be! Interesting stat on vacation homes. I’d love to see a stat on Maine books. It feels like most novels about Maine take place in the summer. There was one out last year that was even called Summer People. My Maine novels take place in fall through June, probably because that’s when I write but also because the long winter really shapes life here for residents. I have picked 2 careers that revolve around solitude, but I enjoy having friends and family around when I’m not working. It’s more of a juggling act during the summer. I like light mayo on lobster rolls since I’m lactose intolerant. Lobster is actually low in cholesterol but got a bad rap because people dunk it in butter. Fresh lobster doesn’t need anything. What a delightful way of earning a living! I can just see how absorbed you are in your water colours...no stress there, I suppose! What a beautiful place to work! While there may be distractions on the beach, I would think the environment would be very inspirational for writing as well as painting. You asked me what I was reading: I picked up Jane Smiley's A Thousand Acres after you had mentioned it or one of her books in one of your posts. I'm not very far--too many distractions--but I feel as if I know these people! Their conversations could have been held around our dinner table many times. My curiosity was piqued by the reference to a modern-day retelling of King Lear. It didn't take too many pages into the book to see that theme, though I'm wondering how Ginny and Rose could possibly turn into evil sisters like Goneril and Regan. One of these days I'll have to read one of your novels--which one would you recommend to read first? Katarina@roses and stuff, I love my work, but I’m not earning a real living at it yet. Only a few artists and writers do, sadly. Rose (it is my day of roses), your relatives picked a great time to see Maine. Yes, I did recommend Smiley’s A Thousand Acres. I’ll be curious to hear what you think when you finish it. That book does feel like sitting down with family. It’s interesting that with your farming background, it rings true. As for my novels, I’d recommend reading the first one that is published. When (if?) that happens, I’ll announce the good news on my blog and website. MOOSE CROSSING is out looking for a publisher, and S.A.D. is with my agent. I’ll be writing NOT CRICKET this fall. If you’re curious about the long process in which a manuscript becomes a published book, read this post: Shaping a Novel, S.A.D. Thanks, it cheers me to know I’ll have readers. I think the first one would make an excellent painting. You are very noble trying to work with your children around.Yours sound talented and helpful. Mine were too, but I did need some uninterrupted time alone too. Your son's picture could be a painting too - a la Winslow Homer perhaps? The summer is going by fast! But it looks as though you are spending the days well! And congratulations on winning the sunscreen contest! Elizabeth, thank you. The first image is a cropped photo where the digital zoom on the Canon Elph lends a texture reminiscent of an oil painting. I discovered that technique by accident in England and enjoy using it. Compare that photo to my header painting. The camera flattens out the landscape and erases detail whereas my paintbrush captures everything I see (except for the house I removed.) Islands remain islands without being squashed into the horizon. I still love both images, and if I had to paint from any of these photos, I agree that the first one could work especially as a large oil painting. As for my son’s shot, that’s the view that I was painting. 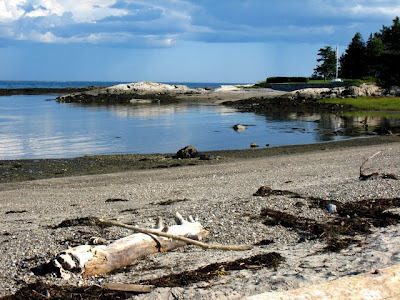 Winslow Homer did paint in Maine, and you can see why. 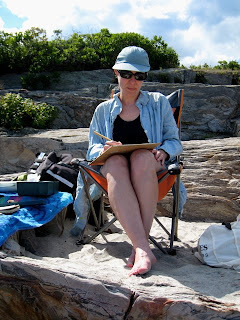 There are many artists who work summers in Maine. Pamela, the summer is going too fast. If only I had more days requiring sunscreen, but I guess it’s better than the intense, dry heat this year in the south. Sarah--Thanks for the response about the camera (in the comments on your last post)--I'm staying with point and shoot for now, but your photos giv me something to aspire to. Bailey's Island looks like a lovely place--I haven't been to Maine in years, but I do love the lobster, and the climate, and the scenery--I have to get back soon. I've been enjoying your Oxford postings, too--i've spent a couple of summers in Cambridge, and I loved it--I can't wait to read your novels. Cosmo, you’ll be happy to know all of the photos on this post were taken with my point-and-shoot Canon Elph. I didn’t want to take my new DSLR to the beach. As you can see, the Elph does well enough for a blog. Cambridge is lovely – lucky you. Thanks, I can’t wait for you to read my novels too! I’ll post on my blog when the first one is published. How lovely to find you at the beach. We too had a day at the beach this past weekend. What wonderful images of Maine and I especially like the one of you taken from behind. I agree with you on the bit about fresh lobster not needing anything. I adore lobsters--but not drowned in butter or mayo. According to my mom, her one and only food craving while she was pregnant with me was lobster. Curmudgeon, interesting that you kept that lobster craving after birth. I ate a lot of spicy Mexican food when I passed my due date. I heard that it could induce labor. It didn’t work, but my son has always loved spicy Mexican food! Bailey Island looks picturesque and charming. Your photographs are lovely! I enjoyed reading of how you are painting ... it is such good food for the soul. Oh, and the lobsters must be divine! Thanks Kate, lobsters and art do feed the body and the soul. A photograph will not interpret for you, but an eye will. The views are delightful. I've never seen a cribstone bridge before. It looks more like a novelty than a bridge but I'm sure it has its uses. Anil, the cribstone bridge works well with the strong tides, reducing the current for boats passing below. Maine seems to have its own way of doing things that work well with the environment.